Rufus – Carol’s lively pony whom she is scared to ride. Patrick is an orphan who lives with his grandfather and pony Taffy. But when his grandfather takes ill and cannot look after him anymore Patrick is sent to a children’s home. He pleads with them to let him keep Taffy and so the pony is installed in the small paddock next to the childrens home. Patrick looks after his pony the best he can but there is not much grazing or money for hay, so he is not in great condition. Also Patrick is worried that one of the other boys at the home, the unpleasant boy Brian, will hurt the pony in some way. But he cannot give up the pony as he feels Taffy is his only friend. It seems like Patrick’s dreams have come true when Mr & Mrs Forrester say they may like to adopt Patrick. They live on a farm and Patrick is sure “that a farmer with all those fields wouldn’t mind one little pony.” But when Mr Forrester sees the unkempt scruffy pony he does not seem very impressed. Patrick goes to stay with the Forresters and their daughter Carol. He is distraught about leaving Taffy but tells himself if he makes a good impression, Mr Forrester may allow Taffy to come and live with them. He is adamant however that if the pony can’t be with him he will not be adopted. He loves the farm and Carol has a very nice pony called Rufus. She is not a good rider and is nervous of Rufus but Patrick finds him a geat ride. Carol assures him that her father will ‘come round’ and allow Taffy to stay. But then one day Partick overhears a conversation between the Forresters where Mr Forrester says he won’t have Taffy on the farm and the kindest thing to do would be to have him shot. Carol and Patrick cook up a plan together to rescue Taffy from the childrens home and hide him on the farm so he can have a holiday and some good food. Carol takes to Taffy straight away, he is gentle and easy to ride and ideal for a nervous child. If only they could all stay here together life would be wonderful, but Patrick cannot forget Mr Forrester’s words and can’t bring himself to like the man. He knows he will have to go back to the childrens home with Taffy as he cannot bear to part with him, even for the wonderful life that he could have on the farm. So when the Forrestor’s ask him if he would like to be adopted he tells them no, much to their surprise and Carol’s misery. He tries to cheer himself up with the thought that he will still have Taffy, but then the inevitable happens. Mr Forrestor finds out Patrick has been keeping Taffy in secret on the farm and is angry. Is this the end for Patrick and Taffy? This book is aimed at a younger readership than most of the author’s stories but if you haven’t read it yet for that reason don’t let it put you off as this is a lovely little story. Strangely, though, it does not feel like one of Josephine’s books. If I didn’t know it was written by her I would have guessed that Diana was the author! I will discuss these differences below. The main theme of the book, and that which makes it so touching, is the character of Patrick and the love he has for his pony Taffy. I feel it is one of the strongest relationships btween child and pony seen in any of the author’s books, whose one possible fault in her writing lies in the lack of deep feeling between the two. This one is different, and in this way much more like one of Diana’s books in which many of the characters are deeply attached to their ponies. The depth of feeling Patrick has for Taffy could be attributed to the fact that after losing both his parents and his grandfather, he feels the pony is the only family he has left. Whatever the reason, Patrick’s love and care for the pony is obvious. It is clear that the author was trying to teach young people that it is important to care for others (be they human or animal) and to put their needs before your own. Patrick is prepared to sacrifice his chance at happiness living on a lovely farm with Carol for a sister, if in doing so this would mean Taffy had to be shot. Josephine cleverly builds up all the factors which could contribute to Patrick’s potential happiness, a motherly figure in Mrs Forrestor, a lovely and lively pony to ride whom he knows he could win prizes with, a nice home, and a potential close friend and confidante in Carol. She contrasts the place to the children's home. His room at the farm is “very different from the bleak, cold room, with its rows of iron bedsteads” back at the home and even the food tastes better. The children at the home, are unpleasant and unfriendly compared to Carol who is eager to like Patrick and be on his side. And Rufus is compared with the poor scruffy little Taffy. Patrick is instantly impressed with Rufus’ looks and his speed, but he is immune to these temptations when he remembers Taffy. In heaping all these temptations upon Patrick it shows his depth of feeling for Taffy when he refuses them all. Unlike many of today’s children, Patrick is not interested in material things. His most treasured possession is Taffy. The character of Patrick is thus very sympathetic and the reader will deeply empathise with him. Perhaps he is a little too good to be true. He is seen as a very helpful and caring child who is sympathetic to Carol’s nervousness. He helps her to ride better and she feels much safer when he is around. He also helps out doing jobs on the farm, despite the fact he cannot like the farmer. 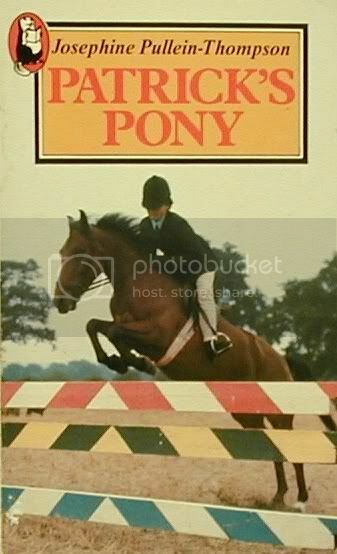 However I think most boys in pony books are rather nicer than the genuine article! I feel the book is slightly darker in tone than most of Josephine’s books which tend to be in general quite up-beat. Again the slight air of menace which hangs over the story is more often seen in Christine or Diana’s books. There is both the threat of Taffy being hurt or neglected if he stays at the children’s home, or even shot if Mr. Forrester has his way. However, unlike her sisters' characters, who tend to be pretty pessimistic and at times despairing, Patrick is more phlegmatic about his life and seems better able to cope with troubles. Another thing which makes this story unlike most of Josephine’s other books is that there is little emphasis on riding and schooling. But although Josephine is not teaching the reader about riding, as she does in most of her other novels, I have already suggested that she is teaching – but this time about life itself. And she does this as smoothly and in as non-didactic a way as she teaches the riding elements. The only faults the book has can be attributed to the fact it was written for younger readers. The writing, although as easy to read as all Josephine’s books, does not quite have the same flowing narrative, written as it was in a more simplistic style for the less able reader. There are also a few gaping holes in the plot. For a start, I am sure a children’s home would not allow one of their children to keep a pony! Secondly, the fact that Mr Forrester does not like Taffy and does not want him on his farm does not quite ring true. Taffy may be a bit scruffy and underfed but it should have been obvious that to a man who knows livestock that this was due to his living conditions, and that with good grazing and care he would soon turn into a fine little pony. But the main plot device which drives the story is the fact that the farmer does not want the pony. Perhaps a more plausible reason could have been found but the author obviously thought that the younger reader would not delve more deeply into Mr Forrester’s dubious motives. However these are minor quibbles and as I have already said are due to the book being for younger readers, so we can easily overlook them. In summary, although a fairly simplistic tale aimed at the younger reader this is worth a read for older horselovers too. If you like a story about character and emotions you will enjoy this, if you prefer something more exciting and adventurous, you will possibly not. I agree with you that is more like Diana's rather than Josephine's.